Arrive as if you are part of the event with a helicopter flight to the Aintree Grand National: 2nd – 4th April 2020. With a direct flight from central London taking 90 minutes, you can experience the thrill of the Grand National first-hand with Atlas Helicopters. 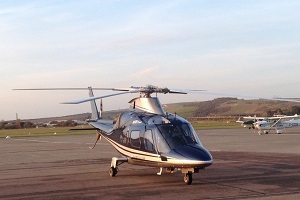 Avoid the queues and travel in one of Atlas’ aircraft such as this beautiful Agusta 109e (pictured). Fitted out in luxurious leather, with room enough for you and up to five guests, this stylish aircraft takes the stress out of travelling. During your flight you’ll enjoy complimentary English sparkling wine from Hambledon Vineyard and copies of the Racing Post, helping you arrive in a bubbly mood, ready to enjoy a great day out and a quick flight home. You can leave from a departure point of your choice and for an estimate use the form below, or call our friendly Operations Team. The entries have been announced. The favourites are drawn. The world’s most famous horse race is about to begin and you could arrive in style, with a flight direct to the course to enjoy one of the biggest sporting events of the year. It is an epic race that is four and a half miles in length, has thirty fence jumps including famous names such as Becher’s Brook, Canal Turn and The Chair. Over 600 million people will be watching the race but you could be there to witness the spectacle. Make the journey to Aintree as enjoyable as the event itself with luxury helicopter charter from Atlas Helicopters. You’ll be picked up from a location near your home or office, and our flexible booking allows you to amend your pick-up time – perfect if you want to stay a little longer and mingle with your fellow racing fans. The quote generator is an exclusive tool that will give you a flight estimate that you can send to us for a quote. If you want overnight accommodation, or fly to a secondary destination, the Atlas Operations Team can arrange everything for you.